In geometry, an ellipsoid is a type of quadric surface that is a higher dimensional analogue of an ellipse with three axis. Calculate its surface area, volume and unknown axis. Ellipsoid, closed surface of which all plane cross sections are either ellipses or circles. An ellipsoid is symmetrical about three mutually perpendicular axes that intersect at the centre. If a, b, and c are the principal semiaxes, the general equation of such an ellipsoid is x2/a2 + y2/b2 + z2/c2 = 1. A special case arises when a = b = c: then the surface is a sphere, and the intersection with any plane passing through it is a circle. If two axes are equal, say a = b, and different from the third, c, then the ellipsoid is an ellipsoid of revolution, or spheroid (see the figure), the figure formed by revolving an ellipse about one of its axes. If a and b are greater than c, the spheroid is oblate; if less, the surface is a prolate spheroid. 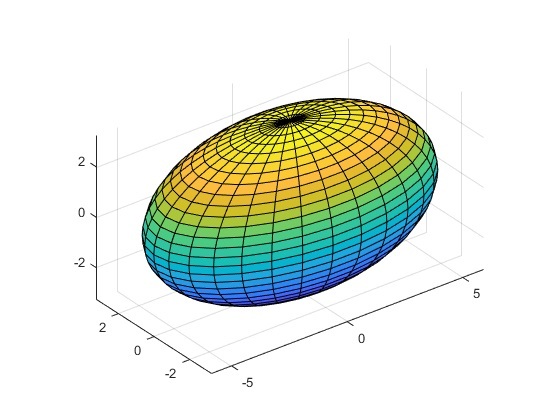 An oblate spheroid is formed by revolving an ellipse about its minor axis; a prolate, about its major axis. In either case, intersections of the surface by planes parallel to the axis of revolution are ellipses, while intersections by planes perpendicular to that axis are circles. Isaac Newton predicted that because of the Earth’s rotation, its shape should be an ellipsoid rather than spherical, and careful measurements confirmed his prediction. As more accurate measurements became possible, further deviations from the elliptical shape were discovered. See also Measuring the Earth, Modernized. Often an ellipsoid of revolution (called the reference ellipsoid) is used to represent the Earth in geodetic calculations, because such calculations are simpler than those with more complicated mathematical models. For this ellipsoid, the difference between the equatorial radius and the polar radius (the semimajor and semiminor axes, respectively) is about 21 km (13 miles), and the flattening is about 1 part in 300.